Notwithstanding the assault on Rhinos throughout Africa, the rangers and tourist guides at Viva Safaris still regard the Leopard as the most difficult member of the Big Five to find on our game drives. The reason for this is the secretive nature of leopards. Usually our sightings are reasonably brief unless the leopard is up a tree with a kill. There are a number of leopards that we know of both in Kruger and Balule that have become habituated to vehicles. 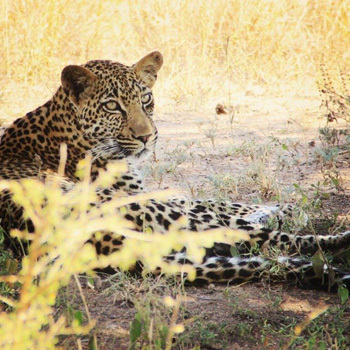 Our guides know of certain “leopard hot-spots” where we regularly see this most beautiful of the big cats. The number of leopards in Kruger Park is unknown as it is very difficult to locate these shy animals via aerial or road census. For many years the figure bandied about was about 1000, but I very much doubt that this is reliable. In fact the leopard has been recently reclassified as “near-threatened“by the IUCN. Although locally common in parts of Africa, leopards are declining in large parts of their range. I believe that this decline is mainly due to habitat loss – as more and more residential and industrial developments are built, so the leopard’s natural habitat is systematically reduced. It is therefore extremely pleasing to know that leopard hunting in South Africa has been banned by the DEA (Dept of Environmental Affairs) until the end of 2016, after which the situation will be reviewed. Also pleasing is news that trade in rhino horn in S A will not be happening anytime soon. Perhaps most pleasing news of the month was the burning in Kenya of 100 tons of ivory and 1 ton of rhino horn. We salute conservationist, Ian Leakey, and the Kenyan president, Uhuru Kenyatta, for the unequalled work done to conserve elephants and rhinos – extremely well done !!!!! April was a very interesting month of game viewing. The weather is changing : mornings and evenings are cold. Our first sighting was of 22 Wild Dogs on S106 eating an impala very close to the road. After a few minutes there was nothing left. Later we had a super sighting of two white rhino feeding along the road. Good sighting of very rare Wild Dogs. On the way to Kumana dam we saw many animals. First was a big herd of elephants with very young babies taking a mud bath in a small pond. We spent almost an hour watching them – it was so amazing. At Kumana dam we saw two lionesses setting up an ambush. We had a brilliant sighting of a huge male lion that crossed right in front of our open vehicle. We saw four giraffes browsing along the river and a group of baboons joined as well. We also saw five hippos grazing along the river. We moved to the highest point to see the Sunset. As I stepped out of the open Landcruiser to prepare our Sundowner drinks we saw a big male lion less than ten metres away. I jumped back super quickly and we waited for the lion to move off. All the guests stayed really close to the drinks and snacks table !!! So this month for me hasn’t been the best month in terms of cats but needless to say it was still a great month in the bush, as always. The lion sightings have been my highlight of the month as on several occasions I managed to find mating lions which is generally quite a rare sighting and they were all close to the road. Most of the time when doing the more exclusive drives in the Balule game reserve we don’t often get as many animal sightings as we do in Kruger but we can get really close and offer a high quality sighting, even if we drive off road. On one occasion, I saw there were fresh Black Rhino (one of the more rare animals to see) tracks which were heading south down the drainage line so I decided to follow them and try cut them off in front of us and before we knew it there they were – a mother and calf walking along looking for a cosy place to rest for the evening. Truly an amazing drive along with many other animals including wildebeest, giraffe and waterbuck. On many of the long and hard drives through Kruger we sometimes don’t get to see too much overly amazing and then always something unexpected happens to make the safari just that much more exciting!!! Like suddenly a whole herd of elephants BAM!!! Right in front of us crossing the road. This happened on several occasions, or even a group of 6 white rhinos crossing the road just 30 minutes before the Kruger gate!!! And even more exciting a big male lion walking right in the middle of the road not bothered at all…..
Snakes aren’t everyone’s favourite animals and we don’t often encounter them but one day this month in Kruger something quite exciting happened which gave my ecstatic Italian y of guests quite an unforgettable memory to take home. I heard of a leopard sighting and drove towards the place when suddenly I saw a male green boomslang (tree snake) – “serpente ! serpente !” they were yelling – crossing the road and I stopped so the guests could take a look at it and as we were all trying to get a good picture of the snake it decided our open vehicle (being green as well haha) was a good place to take refuge and quickly it headed straight for the side of the door and while I was trying to pull away trying to be careful not to drive over it, the snake managed to get into a gap and under the car and disappeared into the gap between the front canopy of the car and the back. I decided to get out and search the car to get it out and circled the car numerous time looking in every gap under the car I could see. After a while I realized the snake would be no threat as being under the car there would be no way it would be able to get to me or the guests while driving and would be easily spotted so I told the guests just to remain calm and if they saw it, must just stay still and let me know. They were very brave! haha. Finally after a few hours of driving looking for more animals, when we got to Orpen gate, Patrick, the other Viva Safaris guide behind me flashed his lights at me and told me something is wrong at the back of my car… Immediately remembering the snake I jumped out and saw the snake coming out of the bottom of the back bumper and I chased it out of the road back into the bush….. Hahaha what an exciting day!!! It has been another successful month all round but especially good with sightings of the Big 5 but unfortunately still very dry conditions, with no rain in Balule. The sightings on the morning drives were stunning. Got 3 lion sightings, 2 of the lion sightings were really spectacular with the sunrise visible just next to the lions. Also had 2 elephant sightings with a few giraffe, jackal and other plains game. The afternoon drives this month were fantastic. Overall I had 5 sightings of lions, 6 elephant sightings, 3 buffalo and 2 black rhino. Had quite a few action-packed days of which there was lots of great sightings. One day in particular that was probably my best this month was when we left for afternoon drive with the same guests I had for bushwalk. I was following the tracks of the lion pride in our area on the drive back to the lodge after a really enjoyable bushwalk. We followed the tracks to the famous and highly productive Tremisana Dam. I knew that the lions would relax there for the day as it was going to be very hot. Naturally it would be the first place to go at the start of afternoon drive…… and there were the lions just lying under the shade of a tree. Shortly after that I headed down to the river where we got elephants and hippos. Then on the way back we were about 10 min from the lodge and out popped a black rhino bull from the bush. Wow !!!! Had a lot more activity this month on bushwalks and the drives to the area where we conduct bushwalks. There was 2 sightings of lions, 3 elephant and 1 very quick leopard sighting. During the one walk we had 1 lion which was a great sighting and we also had 2 elephants. There was luckily a leopard but ran away shortly after seeing us. There was also lot of activity around Marula Boma this month again with the usual Hyenas and Civets as well as some more exciting animals. There was elephants on a number of occasions, the occasional buffalo herd and even luckily enough a pride of lions that walked past. 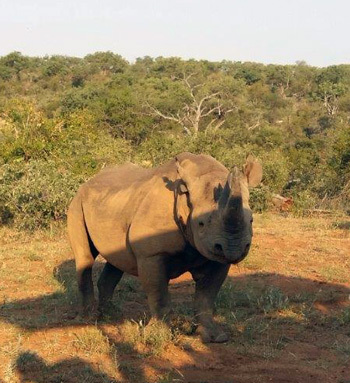 The well-known Zulu the Rhino visiting the game drive. Viva Safaris has sufficient traversing on Balule to keep all our guests quite happy. Bushwalk herd of elephant Rome 1, herd of buffalo north of Olifants Road. Sunset drive pride of lions Barnards dam, herd of elephants Olifants River. Afternoon drive hippo and crocodile by the river. And 1 bull elephant by the river. Sunset drive 2 black rhino’s on Maroela road .Herds of elephants Pondoro Road. Bushwalk herd of elephants Rome 1. Sundowner drive pride of 9 lions Xiugamba Dam. Bushwalk 1 bull elephant charged car before walk herd of elephants Olifants Road. Sunset drive pride of lions Olifants Road. Bushwalk pride of lions 200m from us watch them for 5 minutes and walking away from us. Sundowner drive big herd buffalo Rome 1 moving west and herd of elephants by Spruit. Sunset drive female and calf black rhino at Barnards and herd of elephants Olifants Pondoro Road. Bushwalk herd of buffalo following us Rome 1. Sundowner drive herd of elephants by the river and black rhino Rome 1. Sunset drive 1 big male lion lying down at Tremisana dam. On 2 April I went to Kruger for the day. It was hot and it was difficult to find cats. I tried my best and ended finding all Big Five ! Elephants at Orpen, Leopard at Nwanetsi bridge, Lions towards Imgata lebombo, buffaloes near Nkaya pan and white rhino before Sweni water pan. Beautiful secretary birds at the Sweni pan crossing the road. On the 7th Kruger drive, Timbavati riverbed lioness at the riverbed. On the north side of Timbavati riverbed white rhino grazing, leopard Nsemani dam lying on a tree, buffaloes Kumana dam, white rhino near Kumana again. Elephants with babies washing before S125 towards Tshokwane. On the 13th Kruger again. Lions at Talamati road, white rhino’s in an open area before Imbali junction Elephants at S125 road, Baobab tree leopard lying on the big tree. Kumana dam white rhino, buffaloes, elephants and hippos simultaneously. On the 21st Kruger. 3 lions at Maziti dam lying down, buffalo herd before the dam. Kumana dam lions again with 4 cubs, white rhino lying dawn, leopard with a steenbok kill at S40 . On the 25th Kruger again. Wild dogs at Rabelais (S106), lions at Timbavati road 3 lionesses, white rhino on the riverbed, leopard at Orpen road before the last gate, buffaloes before last gate and elephants Orpen S100 and more general game from Kumana dam towards Satara Camp on the main road. On the 26th Kruger again. Lions with the buffalo kill 1 km after S145 Talamati road, elephants S125 road, Kumana dam more lions there, white rhino on the mud, buffaloes on H1-3 towards Satara, 2 leopard sightings : Nsemani dam and Girivana road S12 dirt road and Timbavati riverbed white rhino lying down. At Satara, during our lunch break, I take the guests to see the Scops Owl which we sometimes find in the parking lot. Scops Owl fast asleep in tree at Satara parking lot. The rains have given new life to the Kruger Park – some water holes are full to the brim. The hippos are slowly moving back to their old homes, which at one stage had turned to bare earth. Elephants can be seen moving across the landscape, dwarfing all around them. The fresh mud and water play a big role in the life of an elephant, helping them keep the insects at bay and cooling themselves down. They can often be seen in the late afternoon and morning, moving towards the water and submersing their entire bodies, with only their trunks sticking out like a snorkel. Dagga boys – also known as buffalo bulls – these are the ones who have lived beyond their prime and now spend their time moving around in small bachelor herds. They tend to spend most of their time sitting around with grumpy expressions, even when they have nice mud or water to cool themselves down. The main buffalo herds can be seen in their hundreds, spending the heat of the day resting under trees, then moving as the day cools. I found myself having to wait on route to the gate, for a large herd of buffalos to move across the road in front of me. The big males tend to take position on the flanks of the herd, to protect the females and young. A great experience to see these big bovines so close to the vehicle, and moving with such purpose to the water hole. The Kruger is home to many prides of lions especially in the central region – my best sighting of lions came about in the late afternoon. We had been for lunch and still hadn’t found ourselves a lion sighting – this was soon to change. I found a few fellow guides who had taken a different route to me, and happened to come across a pride of 18 lions. I headed south of Satara rest camp, straight to where they had been seen earlier. On route we were treated to a great sighting of three white rhinos, not far off from the road. Two of them had found comfy spots in the shade, as rhinos often sleep their way through the heat of the afternoon. The remaining rhino walked slowly along, feeding on a patch of green grass, a beautiful photo opportunity for my guests. We had reached our destination, the point marked by a few cars. 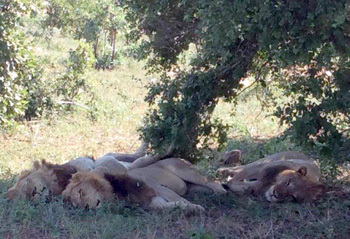 The lions had not moved all day, and could be seen relaxing in the shade of a few magic guarri bushes. From what we could see the pride consisted of two big males, eight females and eight young cubs. As we continued watching the only movement we noticed, came from the young cubs playing. The big males simply lay with their legs in the air, while the cubs bounded around them. A great sighting of the big cats. Activities for the month of April went very well. Experienced outstanding sightings along the western cut line of Rome One. Big herd of buffaloes that roams around the area frequenting between the dam area and south east direction due to the availability of water source. On one of the afternoon drives, hippos formed a streamline as they walked along the eastern bank of the Olifants river. This was extra ordinary amazing sighting for the guests to watch. There have been many great elephant sightings along the river. Kruger activities was also good despite the fact that one could only see animals along or near water points due to shortage of rain. It last rained the beginning of March 2016. The one afternoon proved that Tremisana lodge dam is not the smallest in the nature reserve. A big pride of lions spend the entire day resting few metres on the southern part of the area few metres away from the dam and the hide. 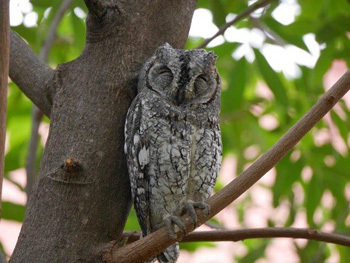 A beautiful sighting is had regularly of a Scops Owl seen at Satara camp next to the reception area. As I stopped with my guests in Kruger, a huge male lion gave a loud roar as the sun was setting while we were driving towards the Orpen exit gate. A symbol of the African wildlife wrapped up the activities for the day. Lion roars across the African plains. This month the weather had a big influence on the environment and the animals inside it. With no rain coming our way most of the animals are starting to suffer. But as one suffers others go into their prime – the one pride down by the river look like they need to crawl on the ground that’s how fat they are!! All in all this is necessary making sure the weak go away and the strong survive to see another day. We were very lucky on morning drives and walks this month. Seeing animals while on a bushwalk is fun but being surrounded by more than 300 buffalo is not the best plan in the word. We got to see a lot of buffalos this last month along with a few elephants, a lot of baboon spiders and of course the amazing black rhinos now and then!!!! While on a morning drive, I decided to have a look at a local dam nearby and have been lucky every time finding black rhino, elephant and buffalo. Driving all around Balule we were very happy when we got the call that the lions were right at our lodge !!! Not just one or two but all 10 of the local lion pride just by our Tremisana dam enjoying the fact that no cars are allowed to intrude on them while drinking peacefully at the dam. Seeing any animal is great fun but on a very quiet night the best thing to do is find the chameleon. I got very lucky in finding one almost every night. 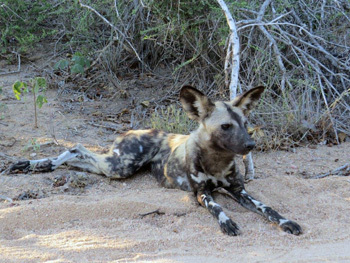 Other than chameleons we were very lucky in seeing for the first time ever in my life Wild Dogs in Balule!!! Unfortunately they are day animals so we couldn’t shine on them to get the perfect picture. Other than that our Marula Boma (where we have the Bush Braai) has been very busy getting visits from lions, hyena, civet and sometimes very naughty elephants! This month we experienced beautiful sightings south of Satara around Kumana dam and Mazithi dam. Around the Baobab tree we’ve had so many leopard sightings. This month we had good sightings of cheetahs there near the Xibotwana windmill along the S100. We have had a high number of rhinos coming out due to the very good weather. The S 125 has two male rhinos. Lions are now very active down south where they are killing so many animals, mostly Buffaloes which constantly need water when is so hot A big pride is permanently camped around Kumana Dam, Mazithi has got four big male lions – look like brothers – same age, height and all look the same. We have nicknamed them the”brothers of destruction”. They are killing every day and sleep on the grass around the dam. Their job is just to kill –vultures, jackals and hyenas are always around the dam looking for left overs. On the way back back to our lodges, we exit from Orpen which provides us with brilliant late evening sightings. We are seeing leopard regularly- the ever reliable big male leopard and the young female moving along the tarred road – what an unbelievable way to end a safari in the greatest game park in the world !! Lions resting in the shade. It was another warm month with some very hot days. But we had also a few cold days when a cold front passed us. We all had to wear shoes (no flip-flops), long paints and a fleece! I’m a Dutch girl and used to the cold, but even I was freezing… I’m too long in South Africa now and used to the warm weather. Also this month we had the usual visitors at the waterhole: vervet monkeys, baboons, warthogs. The piglets are not small anymore, they are getting big! They all do very well. Also the Marabou stork is coming back on a regularly basis. And in the end of the month a giraffe visit the waterhole when we had breakfast. During the night we got sometime visits of porcupine, civet, jackal, genets, hyena’s, lions and elephants. And this month we had a visit of 2 honey badgers during the night. 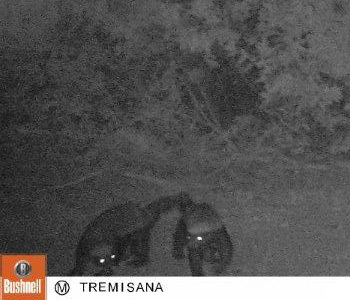 Camera trap shot of Honey Badgers at Tremisana waterhole. April was a good month with a lot of new guests and a guest who came back after 4 years. My wife, Elena and I started at Katekani and Marc’s at the beginning of April. Wow – what a start at Katekani. Elena opened the curtains of our cottage and there was a Blue Wildebeest staring at her. I am not sure who got the bigger fright, but am sure that Elena had to go and change. Whilst checking the building of the new rooms we came across a magnificent Kudu bull. Our guests this month were blown away by their accommodation, and they were reluctant to leave their luxurious, air conditioned, spacious rooms for lunch. All guests were extremely happy with their accommodation, service and well organized outings. Thank you to the teamwork of Viva Safaris. Good lunch spread for guests at Katekani. 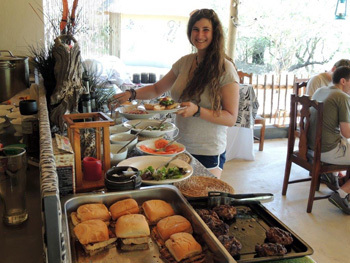 Marc’s Treehouse Camp was extremely busy in the first few weeks, and still has a steady flow of guests. A few guests were extremely lucky to see a Porcupine on the road just before the camp at nightfall and Elena & I were also fortunate to see an Aardvark also on the road. A Leopard has also been seen twice, one at Marc’s camp gate and again near Katekani. The Leopard was on the main Guernsey road. We are sure this has caused the herd of Impala to seek refuge and are sleeping very close to Marc’s Camp at night. Some nights have been a bit nippy and the guests are certainly taking advantage of the fire at the Boma. The Nyalas still abound at Marc’s, much to the guests delight. 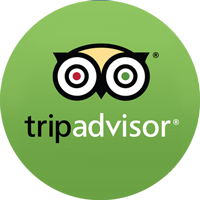 It is absolutely amazing that since the beginning of April, Katekani Tented Lodge has received 6 reviews on Tripadvisor and all of them were rated as EXCELLENT – 5 out of 5. So the management of Viva Safaris is getting to understand how Elena and Allan built the reputation that preceded them – thank you both and well done ! We are pleased to announce that VICTOR NKOVANA has been appointed as Supervisor at Marc’s. I have known Victor for a long time – he has many years of bush experience obtained while he was working in Kruger Park at Orpen. We are seriously considering a new 4 day product : A sleep out safari with emphasis on Big Five walking in Big Five areas. The idea is to have our more adventurous clients sleep out under the stars at 3 different venues – all in Big Five areas. An armed guard will be present at all times and we have made plans in the event of inclement weather. Max number of clients in group will be 7. Day 2 will include a 5h morning walk and a 3h afternoon walk. Day 3 will be a full day in Kruger Park on open vehicle. Any constructive suggestions are welcome ! 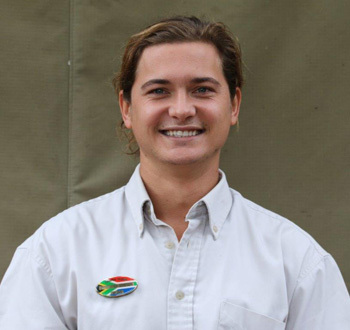 We have engaged Christopher Schoeman to be our partner in this project and our walking guide. Christopher cut his guiding teeth with Viva Safaris at a young age and we are 100% sure that he will make a huge success of this new venture. Christopher our new walking guide. I stayed at Katekani with a friend for four nights in mid-April and it was absolutely amazing! Where to start? The rooms are really beautiful – ours was huge and beautifully decorated with comfortable beds, an indoor and an outdoor shower and it had a lovely African theme. Each lapa has its own private balcony and even a splash pool! Katekani has a minivan which is driven by Victor who is lovely, friendly, helpful and efficient. He was ready and waiting outside our lapa whenever we were due to be somewhere and he was always full of knowledge about the area, plus being fab at spotting wildlife as we were enroute somewhere. Allan and Elena could not have made us feel more at home – we were lucky enough to be the only guests in the lodge but having Allan and Elena there was wonderful. We loved getting to know them over the time we were there. Each lapa has its own splash pool and balcony which are lovely, and there is also a bar which has good WiFi. We didn’t have WiFi in our room but the bar isn’t very far. Sporty people who love the bush! 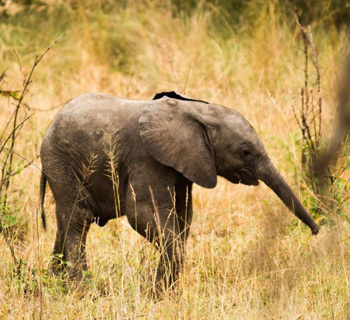 We really loved Katekani – it was very much the highlight of our trip to South Africa. If I’m lucky enough to come back this is the first place I’ll book. Going on a safari in Africa has been a dream of mine for many, many years. The choices available are countless. After doing much research, I chose Viva Safaris. Of the options offered, I decided to stay at Tremisana Lodge, and I’m so glad I did. Where to start… The property was exactly what I was expecting… Large, well maintained and authentic. On arrival, I was greeted by at least a dozen monkeys running around the area, what a great start! The room itself was spacious, simple and kept very clean. The bed was quite comfortable, a must in my opinion. The food prepared for the guests was tasty and enjoyable. Now, for the best part… The people who work at Tremisana. They made everything perfect. Lianne, master organizer and go to person for anything needed onsite, was an absolute sweetheart. I had mentioned an issue one day, and Lianne took care of it literally instantly. Pretty (who incidentally fits her name perfectly); the game drive organizer (among other things) is lovely. The guides: James, Tanya, Bongani and all the other guides who truly go out of their way to make your time in the park sensational. And sensational it was. Way too many sightings to mention, but I do have to mention the last one. On my last morning in the park, James took myself and another guest on an hour tour. Somehow, James noticed footprints in the dusty road and raced to the area he thought the animal the foot prints belonged to would be. Low and behold, we came across the owner of the feet. 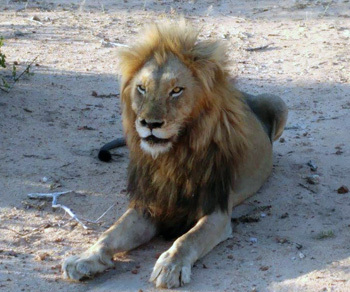 A mature lion named “Sonof”. He was just going about his business calmly and was so close to us, I was able to get at least 50 truly awesome shots including a lion selfie! If you’re debating which safari tour to take, I highly recommend Viva Safaris. It’s is the best, bar none when looking at quality/price, (or bang for your buck) and the friendliness of everyone just makes it all the better. I will be returning next year and am very much looking forward to seeing all of the friends I met this year! Thanks guys, you made the experience exceptional! We had a lovely time staying at Marc’s treehouse. Margaret and team couldn’t have done more to make us welcome and looked after. The rooms (or tree houses) were comfortable and well equipped – with hot showers and a balcony overlooking a small brook. It’s truly an experience and feels very authentic. Going on a safari in Africa has been a dream of mine for many, many years. The choices available are countless. After doing much research, I chose Viva Safaris. Of the options offered, I decided to stay at Tremisana Lodge, and I’m so glad I did. Where to start… The property was exactly what I was expecting… Large, well maintained and authentic. On arrival, I was greeted by at least a dozen monkeys running around the area, a great start! The room itself was spacious, simple and kept very clean. The bed was quite comfortable, a must in my opinion. The food prepared for the guests was tasty and enjoyable. Now, for the best part… The people who work at Tremisana. They made everything perfect. Lianne, master organizer and go to person for anything needed onsite. Pretty (who incidentally fits her name perfectly); the game drive organizer (among other things). The guides: James, Tanya, Bongani and all the other guides who truly go out of their way to make your time in the park sensational. And sensational it was. Way too many sightings to mention, but I do have to mention the last one. On my last morning in the park, James took myself and another guest on an hour tour. Somehow, James noticed footprints in the dusty road and raced to the area he thought the animal the foot prints belonged to would be. Low and behold, we came across the owner of the feet. 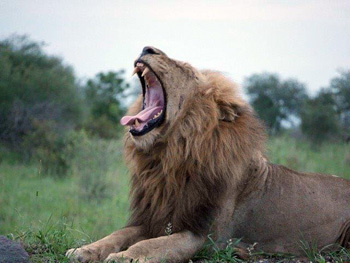 A mature lion named “Sonof”. He was just going about his business calmly and was so close to us, I was able to get at least 50 truly awesome shots including a lion selfie!